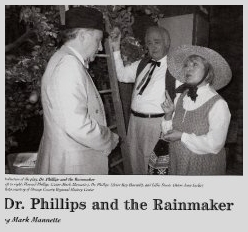 Commissioned and owned by The Orange County Regional History Center, this historic play is based on the real life events of Dr. Phillips, the citrus baron, and Lillie Stoats, the legendary rainmaker. appearance of rain upon Ms. Stoats’ lakeside meditation. It was first produced by the Orange County Regional History Center in Orlando in 2001. It has also been produced numerous times since. It was published in the periodical Its About Time in the fall of 2003.